West Windsor, N.J. – Catherina DePaz, of Hamilton, came home from Seville (Sevilla), Spain, in May after four months studying abroad through Mercer County Community College. She says her first challenges upon her return were readjusting to East Coast time and shopping in American supermarkets. “In Seville, there are no big stores or supermarkets. All the shops are small,” she explains. DePaz also had to get used to speaking English again. “In Spain, I spoke Spanish every day. The family I stayed with and most people in the city did not speak English." DePaz says she felt Seville’s energy from the get-go and was ready to embrace it. “The town is known as having ‘duende,’ which means ‘It has it.’ It’s a place you want to be,” she said, noting the fashionable people she routinely saw on the streets. 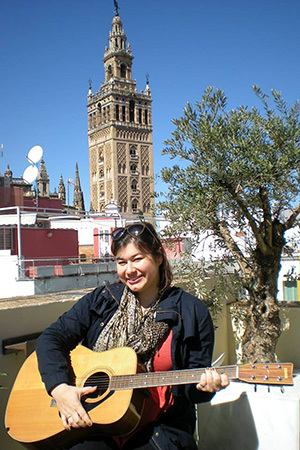 Attending the International College of Seville, DePaz recalls her instructors as worldly, wise and colorful. “The professors were very knowledgeable,” she said, noting that one was local, another came from Scotland and another was a transplant from California. Food was another revelation. “They eat at least one potato product every day and a lot of pork and vegetables. There was a lot of food, but the main meal is served at lunch,” she said, observing that the city shuts down for its daily afternoon siesta when she would return home for a meal with her host family, which was usually accompanied by Tinto de Verano, a red wine and lemon soda beverage that is a local favorite. According to DePaz, siesta is right in line with the attitude she found among Spaniards. “They say, ‘No pasa nada,’ which means no worries,” she said. DePaz notes that she was surrounded by history and took in many of the local historic and cultural sites including churches, the Flamenco Museum, and the bull fights. She routinely walked by a Muslim minaret built by the Moors many centuries ago. She says she thoroughly enjoyed the independence that came with her travels. “There were no curfews. I planned my own trips and I used public transportation to get to and from places.” Among her side destinations were the cities of Tangier, Paris, Amsterdam, Brussels and Barcelona. She notes that Tangier, which she traveled to as part of a group from the university, was unlike any place she had ever been. “The women were covered and the men wore long clothing. The language and the culture were very different.” When she and a female friend ventured out in the evening, they quickly returned to the hotel when they saw they were the only women on the street and were met by stares from groups of men. Having graduated in May with her associate degree in Liberal Arts, DePaz will transfer to Temple University in the fall, where she will study anthropology as she continues to build on her fascination with other cultures and far-away places. The college's Study Abroad Program is planning four faculty-led Study Tours for 2014. Destinations include Costa Rica (mid-March Spring Break), London (mid-March Spring Break), Italy (May 23-30) and China (June 21-July1). 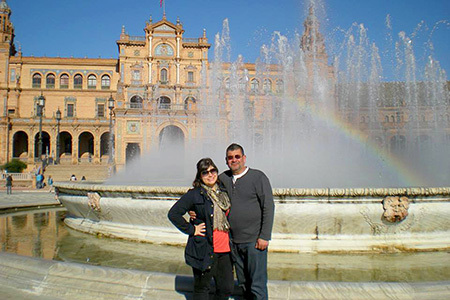 Catherina DePaz with her father, Edgar,who visited her during her Study Abroad experience. They are pictured at Maria Luisa Park in front of a fountain in the Plaza de Espana, which DePaz calls her "favorite place in all of Sevilla." 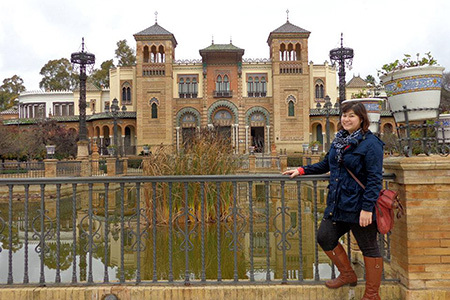 DePaz is pictured in front of the Mudejar Museum (located in Maria Luisa Park), designed to represent the typical Gothic/Arab architectural style that is seen throughout Seville and Spain. for the Cathedral of Seville, is in the background.